Inspired by a real life adoption story, this video comes from the stable of Publicis Singapore. Lately, it seems like it's become a trend for brands to go the "inspired by true stories" route. That being said, it's not very often (none that I can think of in the recent past, off the top of my head) do any of them actually manage to feature the 'real' fighter behind the scenes, as the protagonist of their respective narratives. Vicks' latest ad, although lengthy, is gritty, truthful and 100 per cent true. Starting their journey last year with Gauri Sawant's story, this is the second edition of the campaign, titled #TouchOfCare, created by Publicis Singapore. This tale brings to light the story of a girl named Nisha with Ichthyosis, a genetic skin disorder, who was abandoned by her biological parents within two weeks of being born. Shedding some light on the story behind the campaign, Ritu Mittal, country marketing manager, Vicks India, shares, "The transformation of Nisha, with the love and care provided by her adoptive parents, Aloma and David Lobo, forms the crux of this digital film. This year, the campaign highlighted an important message - 'Every child deserves the touch of care'. Our platform is not specific to one particular story or condition; it's about celebrating those extraordinary bonds formed under unique circumstances." "For us, the biggest challenge was to identify the impactful real-life story of care. " Ritu Mittal." So, what motivated the brand to weave together these two topics - adoption and transgender rights? "As a brand, Vicks have stood for the bond which can be between people who aren't biologically related. Both stories, the one from last year and this year, were chosen because they personified the brand message of - 'Family is where there is care'," states Mittal. Since the ad is based on a real-life story, there must have been some challenges as far as the execution was concerned. Why such a long gap? "For us, the biggest challenge was to identify the impactful real-life story of care. We took a lot of time identifying the story; as you can see, we launched the second edition of our campaign almost 1.5 years after the first one," she admits. What inspired the brand to rope in Publicis Singapore to make an ad for the Indian market? "Publicis Singapore is our creative agency who was involved with the first edition of the campaign #TouchOfCare. They have been an integral part of Vicks for long. They understand the brand as well as the consumer," Mittal responds. "The biggest advantage of working with Publicis Singapore and 20:20 MSL (our media partners based in India), was the relationship we share with each other. We have worked with each other for many years now and therefore, there is a significant understanding of the brand personality and its associated expectation," she adds. Did the agency set out to take up a specific medical condition such as Ichthyosis? Ajay Vikram, chief creative officer, Publicis Group, responds, "We didn't. Our intent and purpose were to bring to life and celebrate the choices that people have made in spite of the challenges and difficulties that they know lie ahead and have done so out of love and care, much like the story of Nisha and her adoptive parents." "Ichthyosis is so rare, but on this shoot, by complete coincidence, one of the crew members also had it, albeit of a different nature. "Ajay Vikram"
The spot is based entirely on the true story of the Lobo family from Bengaluru and the scenes in the film mirror real moments and incidents of when Nisha was growing up. Speaking about the set of challenges faced in the execution, Vikram shares, "Finding an actress to play the role of Nisha would have been the biggest challenge, fortunately, she agreed to take on the role and play herself. As you can see, her real self and personality come across beautifully in the film." Another challenge was portraying young Nisha. Vikram informs us that the director's team of make-up experts created a very authentic look for the actress playing young Nisha. It was also shot in authentic locations, including the Lobo's own home. Vikram agrees, "Yes, but the universality of care and human emotions remain consistent. With each execution, whether for India or the Philippines, we have tried to stay true to the actual locations or milieu in which they took place and as far as possible, like Gauri (Transgender activist) and Nisha, have the heroines playing themselves. Each film is also true to the culture they took place in and we have mirrored real life and not embellished or over-dramatised any occurrence." When it came to the shoot itself, there was a rather unique twist; Vikram elaborates, "Ichthyosis is so rare, but on this shoot, by complete coincidence, one of the crew members also had it, albeit of a different nature. She said she had never met anyone else with that condition till she met Nisha on the set. Nisha's brother Ryan, was also an assistant director on the film. Her sense of humour kept the whole film team in good spirits. Her parents, David and Aloma, are also very engaging people who shared great family stories and anecdotes... the set felt like one big family." The film was a personal passion project for Anand Gandhi who made his Bollywood directorial debut with the widely acclaimed philosophical drama 'Ship of Theseus' back in 2013. Anubha Mathur, vice president, Dentsu Impact feels this film, like the previous, touches just the right emotional chords, "It is a story of unconditional love and exceptional care; one you can't go wrong with." According to her, presenting such a sensitive matter of concern in such a heart-warming manner is truly commendable. "This real story keeps you captured throughout the three-and-a-half minutes and leaves you with an awe-inspiring message. I mean, the facts are unbelievable - 29.6 million orphans in India; of which only 42 children with disabilities found a home last year!" What she liked most about the film is the honesty it is made with. She feels the film maintains the balance of an emotional storyline with a realistic narrative. "It opens on a light note and ends on an impactful one. It carries forward the concept of unparalleled care and positions the brand strongly in the minds of the viewers." "It opens on a light note and ends on an impactful one. "Anubha Mathur." And, what if you were to change one thing about the way the film is executed? "I would choose a more 'real' voice to represent Nisha," is her reply. Echoing Mathur, Navneet Virk, executive creative director, R K Swamy BBDO, says, "It's a moving story, well told and tugs at the heartstrings... I like the unflinching cheer in the tone of voice and the matter-of-fact opening shot, that disarming of the drama of the visual." "If there's anything to change, perhaps it could be a reduction in the length," she adds. "If there's anything to change, perhaps it could be a reduction in the length." Navneet Virk"
Although, the only small niggle in the back of Virk's mind is that she's not one hundred per cent okay with brands focusing on diseases and disability to make themselves look good. 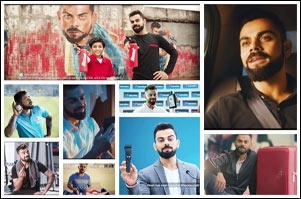 Brand Virat: Over-exposed, diluted or on point? Vicks: It's a 'Jumbo' creative!